Horses in holding pens awaiting their fates. The first thing we noticed when we drove by was the complete chaos surrounding the building. Mixed in with the cars, motorcycles and semi-trucks were horses and carriages EVERYWHERE trotting right down the busy road with the vehicles. 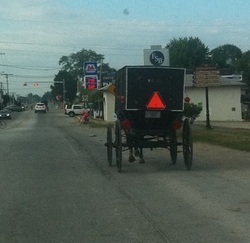 It's not like on TV where you see an Amish family taking a leisurely stroll down a country road. These guys make these horses trot as fast as they can everywhere they go on the cement and asphalt. Since most of them are former Standardbred Racehorses, their trot is seriously fast. We also noticed that almost every horse was checked HIGH, so high, it looked like they could barely see in front of them. We felt so badly for those horses to have to work like this for YEARS, knowing when they were finally physically unable to do their jobs, their fate would be inside the very auction we were about to go into. We were told NOT to park near the auction house, especially with the logo on the side of the truck. So, we parked down the street at a hotel and walked in. The Amish have no regard for pedestrians and seem to have no problem just expecting you to jump out of their way of their horses coming at you at about 20mph. There are many holding pens inside the auction barn, at least 100. They are about 15 feet wide by 30 feet long. But the horses, about 50 total, were crammed into three pens, with ALL of the light horses in ONE pen. We estimated there were 35 horses in ONE PEN! The other pens had about five to six draft horses each in them. Most of the horses didn't even have halters on. While we were looking at the horses, trying to decide who needed us most, we noticed a paint mare in the corner with a foal. Then the foal wandered away from her mom right into the middle of a group of Standardbred geldings. It was a fatality waiting to happen. We, along with another lady, noticed they were pinning their ears at her, definitely getting ready to hurt her. I reached over and grabbed two geldings by the halters, while the other lady WENT IN the pen with these horses and moved the baby back to her mom. It was a very scary moment. That was one brave woman. It was the indifference we noticed the most. Most people just acted like they were at a car auction, bidding on a used car. There were several times Maria and I had to "walk away" to catch our breaths and get our bearings.The auction doesn't even take place in a ring. It takes place in a hallway where the horses are literally run past you. It's because the people there bidding don't care if they're sound or broken in any way. They don't care how old they are or how much training they've had. They are there for one reason, to purchase horses to sell by the pound to the slaughterhouses. The auction took a total of less than 20 minutes. The story continues with the first horse we won-#1 of the Shipshe Four.....now named Rain.